Even though it’s winter, and we still have our house filled with Christmas trees and holly, we’re thinking about wildflowers. Wildflowers seem to come to mind for us whenever we need a bit of a pick-me-up in spirit or a bit of encouragement of the goodness that’s in the world. Lately, as we look back on 2015 and ahead to the new year, we’re thinking about the things that make us most happy so we can bring more of them into our lives. Flowers make us happy. Especially happy and cheerful-looking flowers like wildflowers, which is probably why they’re floating around in our brain right now. If you love wildflowers too, we’d like to offer you a gift for the holiday season. Take this guide to wildflowers and start planning the perfect wildflower garden for planting in spring. Or, go out and buy yourself some of these beautiful blooms from your local market or florist and enjoy them now. Butterfly weed is a popular wildflower. It can be found in meadows all around the world, but it does demand the right soil conditions so there are certain locales that, unfortunately, miss out on its wild-growing beauty. 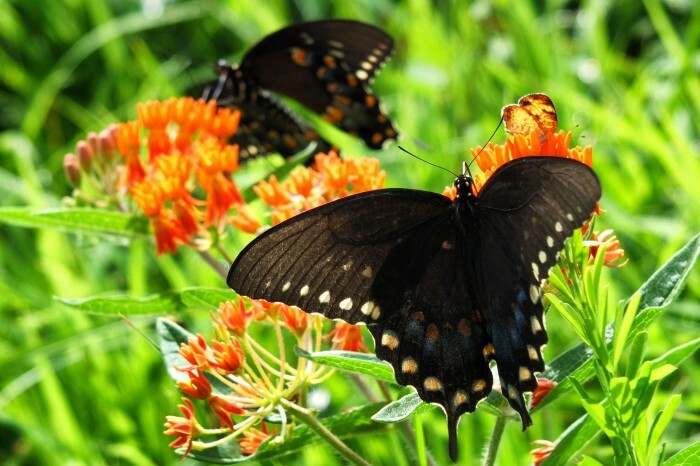 Butterfly weed is a stunning milkweed that has bright orange flowers on low-lying plants. It creates a gorgeous flower carpet in a garden, but it can be plucked to put into tiny vases for cheering up the house. A perennial, gaillardias make a pretty addition to a wildflower garden. They come in a few sizes and shapes, so choose small ones for a border or tall flowers as part of the main attraction in a wildflower display. Gaillardias are easy to grow from seed and they do well in a rough soil environment. Black eyed Susans are some of the most popular wildflowers, in gardens and growing in the wild. You’ll find these flowers on hillsides along the highway, in pristine prairies, and pretty much all over the place. They’re country flowers that also make their way into cities, and they’re known for their sunny yellow petals and deep brown center. Along with these wildflowers, we love to grow and cut queen of the prairie and glorioso daisies. Do you have any specific wildflowers that you make a point to keep around? If so, we’d love to hear about them in the comments below. Even though it’s winter, and we still have our house filled with Christmas trees and holly, we’re thinking about wildflowers. Wildflowers seem to come to mind for us whenever we need a bit of a pick-me-up in spirit or a bit of encouragement of the goodness that's in the world. Lately, as we look back on 2015 and ahead to the new year, we’re thinking about the things that make us most happy so we can bring more of them into our lives.Flowers make us happy. Especially happy and cheerful-looking flowers like wildflowers, which is probably why they’re floating around in our brain right now.If you love wildflowers too, we’d like to offer you a gift for the holiday season. Take this guide to wildflowers and start planning the perfect wildflower garden for planting in spring. Or, go out and buy yourself some of these beautiful blooms from your local market or florist and enjoy them now.